I have been looking for some published adventures to use with my Witch class book. Surprisingly most of the adventures I have been working on don't really feature my witch class. So here are some I have bought over the years. Note: I wrote these reviews while watching "Blood Sabbath" from 1972, featuring a really young Anthony Geary prior to his "Luke and Laura" days. Maybe I can use Alotta, Queen of Witches, from this. 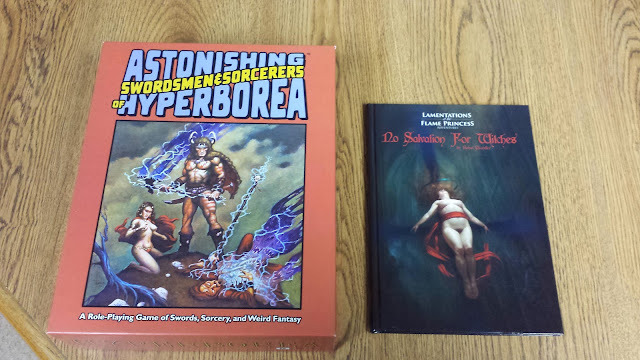 I picked up this Lamentations of the Flame Princess adventure based partly on the name, how could I refuse? I also bought it because I am a fan of +Rafael Chandler and his Teratic Tome. While this adventure uses the LotFP rules, it can be easily adapted to just about any OSR/Old School game. It is also set in +James Raggi's pseudo European setting which also makes it easy to convert to just about anything if you don't mind ignoring some of the history presented. As the title implies, NSFW is not for everyone. It is no worse or no better in terms of art than anything else in the Lamentations catalog or TT. I will give Raggi credit, he springs for some quality art. The adventure itself is weird, bloody and full of body horror. It is also a race against the clock. IF you go with the idea that Woolcott is a witch (and not a LotFP magic-user) and evil then the PCs have something to work for. Otherwise I can't see how the world they create in the end is all that bad? I am kidding, a little. For me I think it would be interesting that if in their goodwill to recreate a better world they made it more horrible. The adventure is a combination of Eurotrash occult horror, Lovecraftian style outsiders and creepy history. There is also a splash of 80s slasher flick in this. It is a heady brew of horror tropes in the guise of an adventure. The Tract of Teratology featured in this adventure is almost worth the cover price. The listed monsters are also really cool and unique. There is just so much I could do with this. It can be hard to judge power level of this adventure. But I am going to say high level at least. The book is 68 pages with covers, maps and OGL. It is also full color. Does it work with The Witch? Yes, but some changes have to be made. Woolcott is obviously a witch, but is she a Witch? I think I would have to think about it in terms of how I want to run it and who or what the Primogenitor really is. This is a meaty module. 84 pages, covers, maps and OGL still leave a lot of pages for material. First off, if you are not familiar with Dungeon Crawl Classics modules they are meant to emulate a certain feel of early 80s play. They went on to create the game Dungeon Crawl Classics, but the adventures are still largely OSR compatible. Actually I didn't see a single thing in this adventure screamed is should be used for one system or the other. This adventure is actually 3 adventures in one. Legacy of the Savage Kings, The Lost Passage of the Drow, and War of the Witch Queen. Each one is a different part of the Witch Queen's plan. Reading through this adventure is one part excitement for the new and one part excitement for the nostalgia. For the new, I wanted to learn more about Kyleth (the eponymous Witch Queen) and the tome Ars Maleficus. The nostalgia comes from many little easter eggs through out the pages that call back to adventures of the TSR-days. I am convinced the Mad Hermit here is the same as the one in the Keep on the Borderland for example. 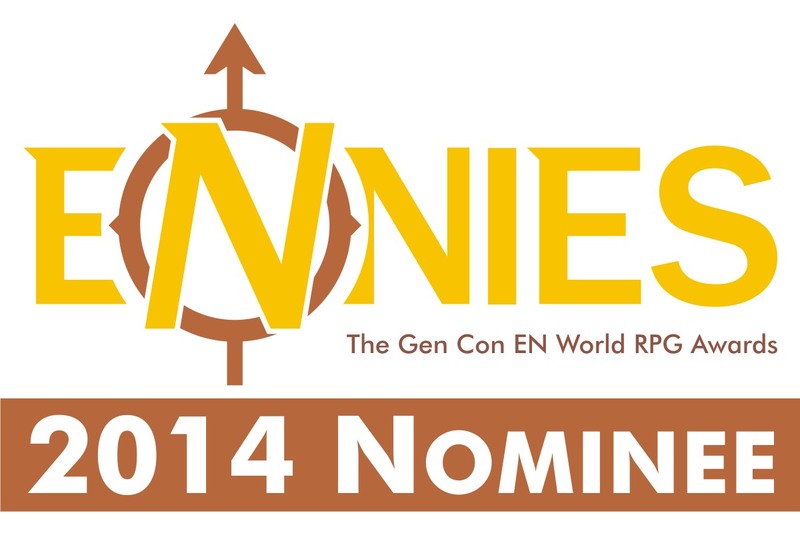 There are also hints of influences from Vault of the Drow, Ravenloft, and even the rest of the GDQ series. In fact the second adventure, "The Lost Passage of the Drow" could be slotted into the D series and no one would be the wiser. Replace Baba Yazoth with the proper Baba Yaga and have one of the many adventures she features in as a side trek. There are a number of named characters that would work well as witches, Maeve, Baba Yazoth and of course Kyleth herself. While using the title of "Witch Queen" Kyleth is only an 8th level Magic-user. Make her a 9th or 10th level witch and then you have something really scary. Does it work with The Witch? Yes, absolutely. 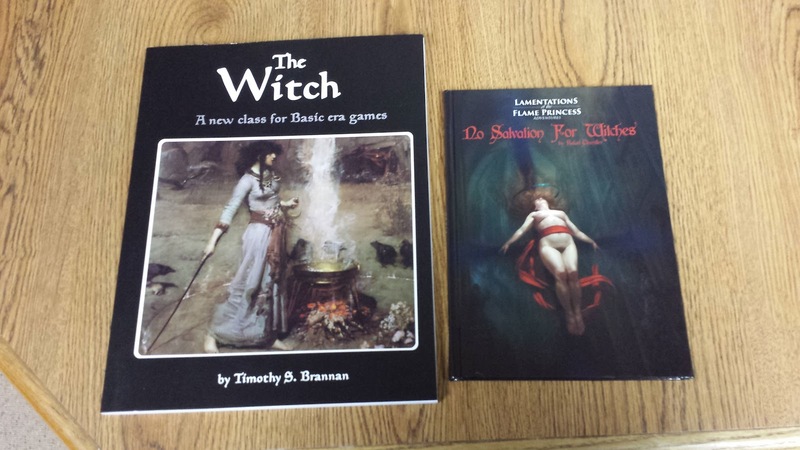 There are number of great items and story points in this adventure for any witch character. In fact I would say that any good witch would want to see Kyleth taken out on general principle. Plus there are a number of encounters and NPCs that would benefit from the rules in the Witch. Night Hags get more spell casting powers for example and the medusa can also have some levels of witch. Of course there is the one issue of Kyleth being one of The Thirteen. 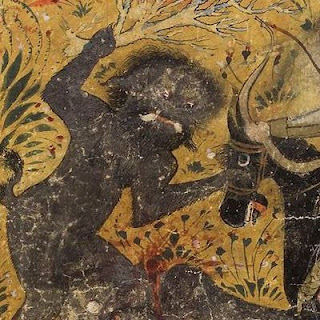 The Thirteen most evil wizards, witches and necromancers in the world. She was the newest member, who are the other 12 and what are their plans? Anyone up for an adventure against the Legion of Doom? I might have to come back to this idea. I can see witches, vivamancers, blood mages, evil wizards, and necromancers part of this evil cabal. Each providing something different. Seriously, there is so much fun stuff here I can't wait to try it out. This adventure is really more of hex-sandbox. It is two pages and the central conceit is the characters are stranded here till the next boat arrives so they might as well figure out why the place is dying. There are some suggested quests and some points of interest. There are a couple of witches mentioned. The Gray Lady is the spectre of an old witch. She is also a quest. Dispatch her to help bring the area back from extinction. There is also the remains of a witch cult. They are not described in any detail. Does it work with The Witch? Yes. Only in teh respect that the adventure has so little detail that it works with anything. Now for some people this is perfect. Indeed I can see a number of sessions based on these two pages alone. You can drop it into any game as a break from the regular campaign. But if you want more meat to your module then this might not be for you. 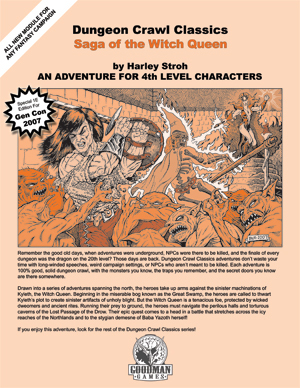 A 24 page OSR adventure (2 covers, toc, ogl, 3 maps). It's a good adventure of the "there is something strange going on in the woods, let's investigate!" type. The hazards make this more of a challenge for 3-7 level characters instead of say 1-3. That is fine really. I would use this to lull seasoned players into a false sense of security and then show them there are still dangers to be had in simple settings. This is the perfect adventure for say a lazy afternoon. You can drop it nearly anywhere in your world. Our main bad guygal is Llorona, Witch of the Tarriswoods. She is a 5th level magic-user. There are also some new monsters in this that are a lot of fun. Does it work with The Witch? Yes. I say change Llorona to a 5th or 6th level witch and give her some more spells. Given her name, dress her in blue and white gowns and focus on water-based spells. change the "wizard staff" to a trident or tined fork. This would make her much more of a threat. This one is for Swords & Wizardry, but can be played in any OSR game really. 14 pages, 2 mapes, cover, ogl. This is the S&W conversion of the Castles & Crusades adventure. The adventure is a good introductory adventure for players and low level characters. It is a simple two level dungeon that used to be the home of an evil cult. So there are a lot of undead and some demonic powers here. The catacombs are supposed to be filled with treasure according to legends. Given that this all takes place on "Witch Hill" I would want to expand its history a bit to say more about the cults that were there. I would make the cult a coven of witches. What I think works best about this module is not only can it be located anywhere, but it can even be located under anything in another adventure. A little tinkering and suddenly I have "The Ruins on Witch Hill". Does it work with The Witch? Well. There are no witches in this. So unless I want to make an active cult there (and that is really a good idea) then there is not much to add from my book. 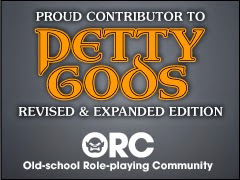 Save for some magic items and scrolls with ancient spells. When I first got this years ago, but long after I had moved away from AD&D 2nd ed, I was not that impressed. Now looking back at it, it has a certain charm and it does better than my memory of it. The Witch class is a sub-class of Magic-User, but the experience for each level is much lower that I have seen for other witches. There are plenty of new spells and in true old-school fashion some classes and monsters are completely immune to the witch's power/spells. In addition to all of this there is a marsh that is the home to many evil witches. Given how JG used to write the adventures it can be converted to a lot of systems with ease. Does it work with The Witch? For the most part yes. While this book was not an influence on my writing of the witch class it does have similar DNA. That is to say the feel of this book and the time it was published was something I sought to emulate in my own witch. The classes themselves are not really compatible save that the witch in most cases is compatible with a wizard. The adventure is certainly usable by today's OSR games. Ah. Now this one is an interesting case. It does have an adventure and specifically designed to use my witch. "Witches of the Dark Moon" is a great little one-shot written by +Tim Shorts himself using a lot of elements he had at his disposal. This includes using my own Witch Class for the witches. You don't need my book to play this, but it does add a little extra to the mix. Does it work with The Witch? Completely. Adventure Path/Campaign: War of the Witch Queens? I wonder if I have enough here to make an adventure path/campaign to go after the evil witches in the world, while at the same time protecting the good witches? (hey, I have my biases). Plus there are an inordinate number of marsh and swamp related locales here. I am thinking that running these under B/X D&D, Adventurer Conqueror King or Astonishing Swordsmen & Sorcerers of Hyperborea and capping the levels at 13. Friday Night Videos: Celebrate Summer with Rush! Well...so much for that idea.